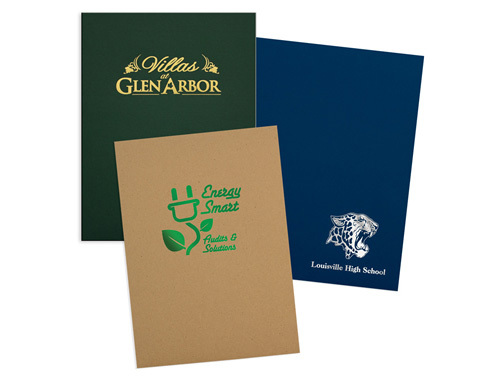 Accent Printing Solutions can handle presentation folders (also known as pocket folders) of all colors, shapes, and sizes for your business. 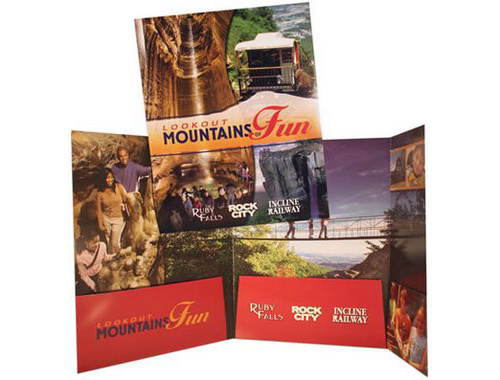 Presentation folders are perfect for handing out information to potential customers at shows and meetings and also a professional way to keep your marketing papers and promotional pieces together and organized. 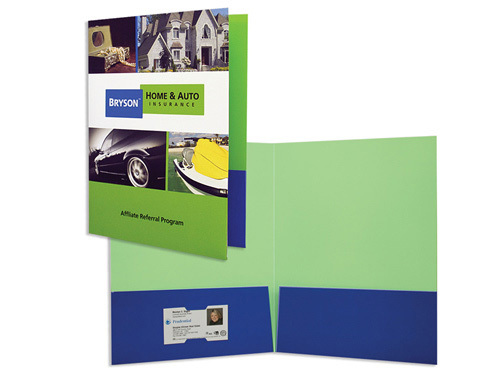 Whether you need full-color, standard-sized pocket folders or custom presentation folders, die cut folders with a thick spine and large pockets, we can work with you to make sure your presentation folders are a perfect fit for your organization. There are many options to choose from and we can help decide what type of presentation folder works best for you. 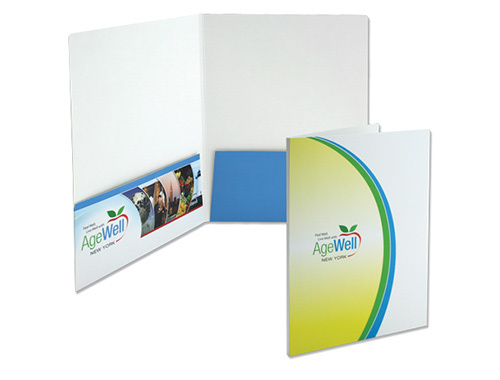 STANDARD PRESENTATION FOLDERS These are our our most popular, standard pocket folders. The folders are 9" x 12" and have two 4" pockets. They can be custom printed, foil stamped, or embossed. 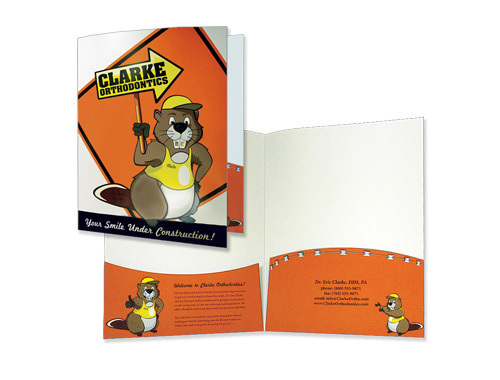 You can finish the printed pocket folders with a gloss, satin, or matte coating. Lamination, UV, and soft touch are also available options. Pre-cut slits for holding business cards. THREE PANEL PRESENTATION FOLDERS These three panel folders are 9" x 12" and have one glued left pocket and one center unglued flap in the center. The pockets are 4.25" tall. 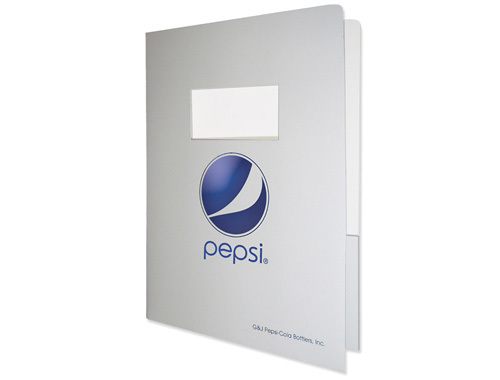 You can finish these printed pocket folders with gloss, satin, or matte coatings. Pre-cut slits for holding business cards. Lamination, UV, and soft touch are also available options. LEGAL PRESENTATION FOLDERS These presentation folders are perfect for legal-sized documents. The folder size is 9.5" x 14.5" and has two 4.5" pockets. They can be printed, foil stamped, or embossed. Lamination, UV, and soft touch can also be done. Pre-cut slits for holding business cards. Top right corners are rounded. WINDOW PRESENTATION FOLDERS These die cut window folders are ideal for creating customized presentations. The folder size is 9" x 12", has two 4.25" pockets and the windows are 2" x 4”. They can be printed, foil stamped, or embossed. Lamination, UV, and soft touch can also be done. Pre-cut slits for holding business cards. Top right corners are rounded. CURVED POCKET PRESENTATION FOLDERS These presentation folders are 9" x 12" and have two creatively unique curved custom pockets. They can be printed, foil stamped, or embossed. Lamination, UV, and soft touch can also be done. The top right corners are rounded. 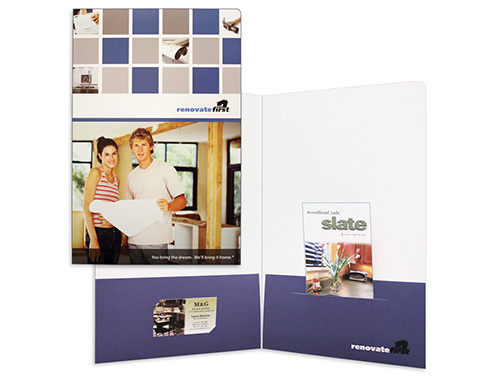 WAVE POCKET PRESENTATION FOLDERS These presentation folders are 9" x 12" with two creatively modern wavy pockets. The custom folder pockets are 5" deep. 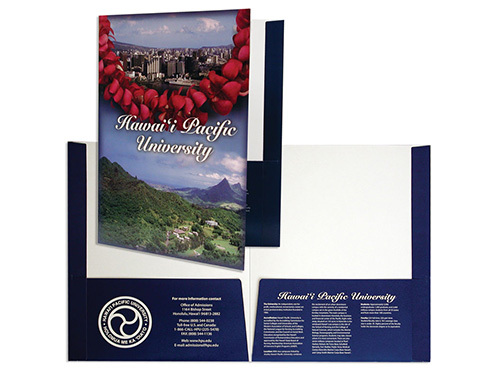 The folders can be printed, foil stamped, or embossed. Lamination, UV, and soft touch can also be done. Pre-cut slits for holding business cards or CDs. BOX POCKET PRESENTATION FOLDERS These presentation folders are 9" x 12" with two 4.25" pockets and .25" spines for thicker documents such as catalogues or brochures. 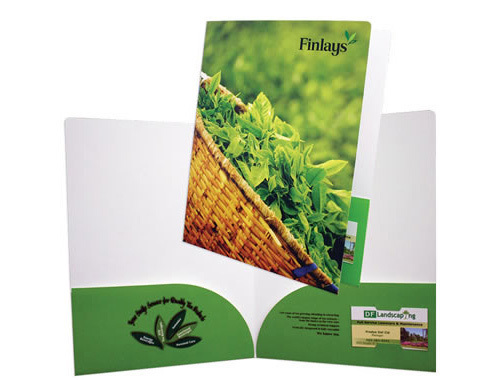 The folders can be printed, foil stamped, or embossed. Lamination, UV, and soft touch can also be done. Pre-cut slits for holding business cards or CDs. FOIL STAMPED PRESENTATION FOLDERS These very popular, foil stamped, presentation folders are 9" x 12" with two 4" pockets. Choose from over a dozen metallic and non-metallic colors. Standard coverage for the foil stamp is 15 square inches. Pre-cut slits for holding CDs or business cards. 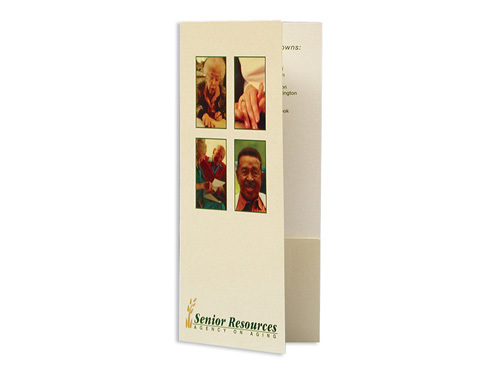 POLICY OR “POCKET” PRESENTATION FOLDERS These presentation folders are 4" x 9" with two 3" pockets and are available in portrait and landscape orientations. They can be printed, foil stamped, or embossed. Lamination, UV, and soft touch can also be done. Pre-cut slits for holding business cards. TURNED-EDGE OR “CASEMADE” PRESENTATION BINDERS Custom turned-edge binders give the binders the appearance of hardcover books with a high-end look and feel. 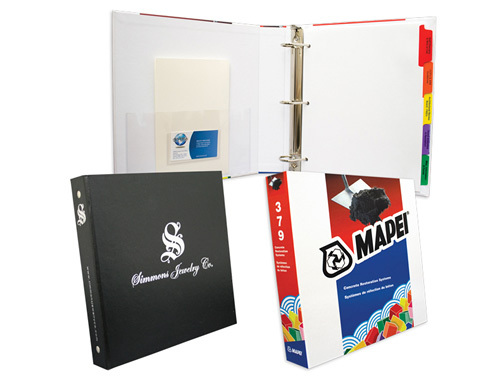 These binders are practical and have a professional finish. Decorating options include PMS printing, screen printing, foil stamping, and four color process printing. REINFORCED PRESENTATION FOLDERS These presentation folders are 9.5" x 11.75" with two 4.5" pockets and reinforced side edges. These features provide extra durability when opening and closing. They can be printed, foil stamped, or embossed. Lamination, UV, and soft touch can also be done. 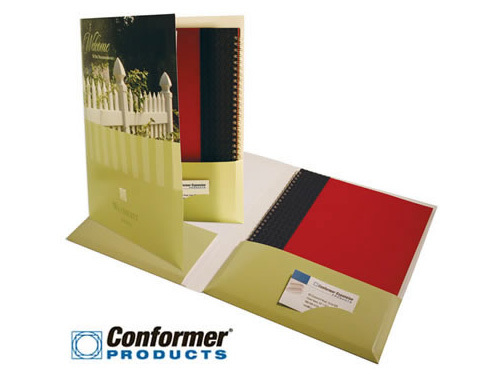 CONFORMER PRESENTATION FOLDERS These special 9.5" x 12" folders have two 4" pockets. The left pockets are glued at the outer edge. The right pockets are glued on both sides. The folders lay flat but expand for thicker documents. The folders hold up to 3/8" per pocket.